[Fig. 38] This glacial valley is an 8-mile-long reservoir for the city of San Francisco, which purchased the land and all the rights to it and the Tuolumne River in 1908 for $600,000. Even though the floor is flooded with Tuolumne River water behind O'Shaughnessy Dam, it is still an attraction for many hikers and campers because of its waterfalls and many similarities to Yosemite Valley. Hetch Hetchy's Wapama Falls spills 1,200 feet over a granite precipice. The falls are spawned by Falls Creek, a tributary of the Tuolumne River. John Muir compared the falls to Yosemite Falls, although Wapama is only 1,700 feet compared to more than 2,400 for Yosemite Falls. Kolana in Hetch Hetchy occupies roughly the same location in this valley as El Capitan does in Yosemite Valley. Tueeulala Falls is similar to several falls in Yosemite Valley. Muir considered Hetch Hetchy Valley to be as rare and beautiful as Yosemite Valley. He made the statement often in the course of the battle over the Tuolumne River with San Francisco. The federal government resisted several attempts by San Francisco to secure the valley, but succumbed to political pressure in 1907. During those battles, Muir wrote: "Sad to say, this most precious and sublime feature of the Yosemite National Park, one of the greatest of all our natural resources for the uplifting joy and peace and health of the people, is in danger of being dammed and made into a reservoir to help supply San Francisco with water and light, thus flooding it from wall to wall and burying its gardens and groves 100 or 200 feet deep. This grossly destructive commercial scheme has long been planned and urged (though water as pure and abundant can be got from outside of the people's park, in a dozen different places), because of the comparative cheapness of the dam." These days, the Sierra Club continues to advocate for restoration of Hetch Hetchy Valley. Others point out that in the last decade San Francisco has undergone brief scares over cryptosporidium, a mysterious spore found in surface water. In Hetch Hetchy, no one has proven there is cryptosporidium, which causes a variety of flulike symptoms and can be fatal to immune-deficient people. But many believe it is another reason to tear down O'Shaughnessy. Anyone who drinks water from the reservoir or any other surface water in the Sierra should filter it or use iodine pills to purify it. Even rivers in Yosemite are considered to be too dangerous to drink unfiltered. But many things about Hetch Hetchy have not changed since Muir fought for the valley. Muir noted Douglas fir (Pseudotsuga menziesii), yellow pine (Pinus ponderosa), sugar pine (Pinus lambertiana), digger pine (Pinus sabiniana), and incense cedar (Libocedrus decurrens). He also found tangles and clumps of western azalea (Rhododendron occidentalis), mountain spiraea (Spiraea densiflora), woolly sunflower (Eriophyllum congdonii), and spice bush (Calycanthus occidentalis). With few exceptions, the vegetation is still visible in the area. Like Yosemite Valley to the south, Hetch Hetchy Valley was a narrow or V-shaped river gorge before the Ice Age of 2 million years ago. It was covered with timber in a coniferous forest, much the same as it is today. When vast rivers of ice began moving down the Tuolumne River gorge, they filled Hetch Hetchy Valley and relentlessly ground the granite away. The valley is now U-shaped. It has a hanging valley above it where Tueeulala Falls comes down in surges with a wispy mist. Smaller glaciers came down the valley where Tueeulala now flows. The larger glaciers in Hetch Hetchy met the smaller glaciers and carved off the end of the smaller valley. Directions: Drive 45 miles east on Highway 120 from Oakdale on the northwest side of Yosemite. About 1 mile west of Yosemite's Big Oak Flat entrance station, turn north on the Hetch Hetchy turnoff, which is Evergreen Road. Evergreen Road becomes Hetch Hetchy Road after 7.5 miles. The Hetch Hetchy entrance station is about 2 miles beyond the junction of Evergreen and Hetch Hetchy roads. Drive another 6.5 miles beyond the entrance station on Hetch Hetchy Road to the parking lot above O'Shaughnessy Dam. Activities: Backpacking, hiking, camping, photography, and picnicking. Facilities: Backpacker campground, vault toilets. Dates: The road is open until the first snow storm in Nov. It reopens after the snowmelt in May. Closest town: Groveland, 18 miles. For more information: Yosemite National Park, PO Box 577 Yosemite, CA 95389. Phone (209) 372-0265. [Fig. 38(1)] The hike to Lukens Lake is less than 1mile, but the benefits of the short walk are considerable. The lake is full of troutmainly rainbow trout and Eastern brook trout. The ecosystem at this high country lake is also an attraction with many kinds of animals that represent the subalpine belt6,000 to 8,000 feetin the Sierra. Predator animals at these elevations are generally smaller than they are below 6,000 feet. Look for the mountain coyote (Canis latrans), great horned owl (Bubo virginianus), and the marten (Martes americana). For wildlife photographers, the marten would be a particularly difficult and coveted subject to find. 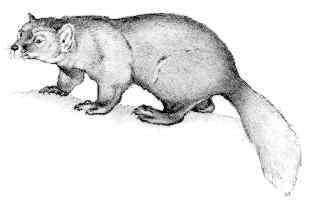 The marten, which efficiently hunts rodents, is very secretive. The marten's cousins, the long-tailed weasel (Mustela frenata) or the least weasel (Mustela erminea), are more likely to be seen. Directions: Drive about 16 miles east of Crane Flat on Tioga Road. Park on the south side of the road near the Lukens Lake sign. The trailhead is across on the north side of Tioga Road. Elevation: 200-foot gain, 8,340-foot peak. [Fig. 38(2)] The trail is an easy way to find great views of Hetch Hetchy's waterfalls. Photographers like to take this short walk in spring for a photo of Tueeulala Falls and Wapama Falls to the east. This is North Mountain, where a fire lookout was established many years ago. The lookout is no longer used. The trail is also nice walk for its natural features. Look closely at the granite on Lookout Point and see the scratches and grooves left by a glacier more than 12,000 years ago. Trees do not grow in abundance on the granite surface. The tenacious Jeffrey pine can survive, but few other conifers grow here. In the lower and more sheltered elevations along this trail, the white fir and incense cedar grow in small stands. The natural grasses in the lower elevations include Hansen's bluegrass (Poa hanseni) and western needlegrass (Stipa occidentalis). But many exotic grasses have been introduced to the Sierra and California in the last 100 years. Directions: Drive 45 miles east on Highway 120 from Oakdale to the Evergreen Road, about 1 mile west of the Big Oak Flat entrance station. Turn north on Evergreen at the Hetch Hetchy turnoff sign and drive about 7.5 miles to Hetch Hetchy Road and turn right. Drive about 1 more mile to the Mather Ranger Station and park. The trailhead is marked near the ranger station. Elevation: 450-foot gain, 5,265-foot peak.